Our comprehensive suite of offerings helps stakeholders become informed and aligned, and make strategic location decisions. Location monitoring services: Track more than 50 risk parameters across each of the 200+ global services locations using Everest Group’s proprietary risk monitoring tool, Advanced Locations Tracker. The tool has built-in functionality to synthesize views across risk factors and cities via a risk assessment dashboard. 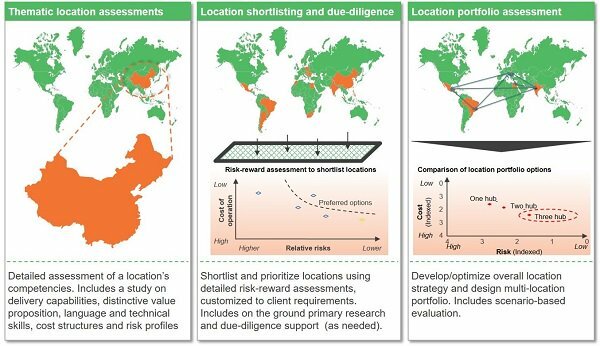 Location portfolio assessment: Detailed analyses to determine the overall sustainability of a service delivery portfolio, including strategies related to placement of processes and functions across locations and business continuity planning requirements.